Redefining the digital experience at Home - Hello! Welcome to my blog! The home broadband landscape in the Philippines shows that 87% of households still has no access to an Internet connection. Coupled with the increasing line of streaming content, which is now more accessible and affordable, Globe At Home knows there is tremendous opportunity to disrupt the home broadband business. Putting fresh investments into fixed wireline connectivity, Globe aims to capture the home by giving Filipinos more affordable data, exclusive content, as well as innovative services – all for a seamless experience for the whole family. “The time is ripe to disrupt the market and break the barriers of getting a broadband plan through accessibility and ease of application. 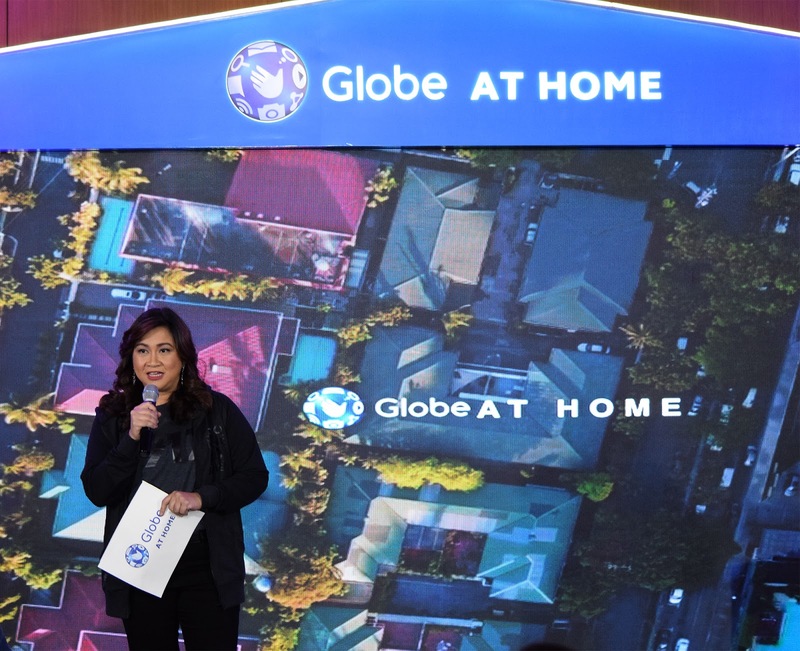 We are committed to provide fast and reliable home connectivity to more Filipinos, nationwide,” says Globe At Home Senior Vice President, Martha Sazon. Globe At Home introduces its latest innovative offers for its prepaid and postpaid customers that will change the way families watch, listen, play, share, and learn! Today, customers no longer need to worry about committing to a lock-up period to get a postpaid broadband plan. Globe At Home introduces no lock up-plans that can be availed without the usual 24-month contract. Customers can avail of any Fiber or DSL lines with speeds of up to 50 Mbps for only P499 for the first 3 months. Customers can try their chosen plans in their homes without lock up or commitment. It comes with free installation and requires no documents other than one (1) valid ID for processing. Customers just need to pay a one-time modem fee. After the three-month trial, customers can choose to maintain their initially selected plan or choose another. Available plans are Plan 1299 for 5 Mbps and 400GB of data; Plan 1599 for 10 Mbps and 500 GB of data and Plan 1899 for 50 Mbps and 600 GB of data. Those who prefer to discontinue their subscription within the first 15 days will get a 100% refund of their modem fee upon the return of all devices installed in their home. Complementing this is the introduction of the Globe At Home Tech Squad. They are a team of experts best equipped to assist customers in setting up a connected home. They will provide end-to-end support from installation to troubleshooting to enhancing the broadband experience to maximize one’s Globe At Home connection. 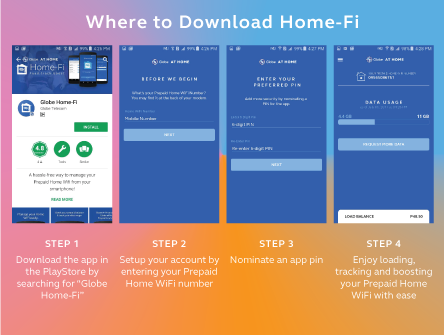 Leveraging on the strength of our mobile expertise, back in February we launched the Globe At Home Prepaid WIFI to connect more Filipino families. It is easy to install and has 50% stronger WIFI coverage versus myfi. Best of all there is no need to commit to a fixed monthly rate so one can better control their budget. Aside from it being extremely convenient, it is also easy on your pocket. Globe At Home introduces the most affordable 1GB data promo ever at just P15 with HomeSURF. Users can enjoy this offer on top of their existing GoSURF50 subscription. Heavier data users can also enjoy bigger data allocations, like 10GB of data for P349 valid for 10 days, and an extra 15GB of data for P599 valid for 30 days. It is exclusively available through the Globe At Home App. This app will help users load credits charged to any Globe mobile number, track total data usage consumed by those who connected to the device, as well as boost data allocation through easy registration to promos. The app notifies users once their data allocation has been consumed. It is easy to set-up just by entering the Prepaid Home WIFI number and preferred PIN. It will be available for download on the Google Playstore and the App Store by October 15. Since the expansion of its footprint and the deployment of leading edge network technology, the Akamai State of the Internet Connectivity Report revealed that the first quarter of 2017 showed that the Philippines experienced significant improvements in broadband speed and adoption. The country’s average fixed broadband speed increased by 5Mbps or 57% year on year, while the country registered the strongest growth in terms of adoption in Asia Pacific with a 111% growth year on year. With all these innovations in place, the vision of Globe at Home to connect two million homes by 2020 through high-speed internet and provide affordable world-class entertainment, is well on its way to become a reality. For more information on the new Globe at Home plans, visit the website at https://shop.globe.com.ph/broadband, call the Globe hotline at 730-1010, or visit any Globe Store.